"I am honored to be in my country Macedonia", said Prince Ghazanfar Ali Khan of Hunza, as he arrived in Skopje, the capital of the former Yugoslav republic of Macedonia in July this year, according to Financial Times. So what is the Wali of Hunza doing in Macedonia? It is hard to believe but true that Pakistan and Pakistanis figure prominently in the ongoing struggle for the inheritance of the legacy of Alexander, the Great, and with it, Macedonia as a moniker. Both Greece and the country of Macedonia, officially called the "Former Yugoslav Republic (FYR) of Macedonia" by UN and other international bodies, claim Alexander's legacy. The prince, his wife Princess Rani Atiqa and their entourage claim descent from Alexander the Great’s conquering army, which reached their Hunza tribal homeland in northern Pakistan 23 centuries ago. The princely state of the Hunza is currently in northern Pakistan, former part of Persia, and the place of their residence is, according to historic data, the most eastern point of the kingdom of Alexander of Macedonia. Hunza folklore gave a shot in the arm to the ex-Yugoslav country of 2m – still embroiled, 18 years after independence, in a frustrating “name dispute” with Greece, whose northern province is also called Macedonia. Greece has opposed the country of Macedonia calling itself Macedonia. To pacify Greeks, the world calls the nation of Macedonia F.Y.R. Macedonia, where F.Y.R. stands for the former Yugoslav republic. As Greece and F.Y.R. Macedonia fight over their claim to the name of Macedonia and Alexander's heritage, they have both been courting the Kalash and Hunza people of Pakistan. While the FYR of Macedonia rolled out the red carpet for the prince of Hunza, the Greek government is funding the cultural activities of the Kalash people of northern Pakistan. The fair-skinned, blue-eyed Hunza people, whose own accounts trace their descent to Alexander’s march-weary troops, are renowned for their longevity and their high literacy rate, says the Financial Times story on Hunza. In the 1930s, scientists in Nazi Germany also combed the Himalayas in search of lost Aryan cousins. In addition to the Macedonian prime minister and his cabinet, the Hunza delegation also met Archbishop of Ohrid and Macedonia, HH Stefan, and Skopje Mayor Trifun Kostovski, according to Turkish Weekly Journal. The delegation visited sites and towns throughout Macedonia, and attended the renowned Galichnik Wedding. The Hunza visit was organized by Macedonian Institute for Strategic Research. FYR Macedonia has been making efforts to seek the attention and support of the United States in its fight with Greece. As a part of this campaign, Macedonian officials attempted to ingratiate the US by trying to become an ally in the war on terror. Macedonian security officials planned and staged fake anti-terrorist raids in which six innocent Pakistanis and an Indian migrant were killed in cold blood in late 2001, two months after 911 attacks. The New York Times covered the details of this fake tale of terror in Macedonia in a May 2004 story. The Hunza prince's sponsored visit, and the warm welcome he received in Macedonia, seem to be a continuation of the same cynical campaign that started with the massacre of innocent Pakistanis in Macedonia. The usability of Pakistanis as Pawns world over has really started to amaze me now! Here's an email commentary I received from Razzak L.
I have traveled and stayed several times in Hunza during 1973 and then much often 1980 to 1994 on and often in connection with Bridge Building on Karakorum Highway which connects Pakistan with China via Gilgit and Hunza. I have seen a diff rent story there. First Time:1973: A short Visit from USA: Before old Bhutto kicked out the old Wali and annexed Hunza in the fold of Federal Wing. People were living in abject poverty. Wali in a Mountain Castle with imported furniture. Three Phonographs were hanging on the wall of Living Room: Chu-en Lai, Ayub Khan and Late Nehru. By geographic juxtaposition Wali was perhaps not sure who would walk over. One had to be careful in politics when you are tucked within 3 borders. With me was Ismaili Khoja Businessmen from Kenya thinking of starting a Juice Nectar Factory. Wali asked for 40% cut on gross. While we were leaving the Queen took fancy of diamond ring on Businessman's finger and relieved him of it. Water is mixed with mountain silt. Thats drinking water. Rest House's Warden's daughter had typhoid. The Farmer on whose farm we were rwaitingng for our 4x4, came near our charpoy under the and asked to pay pay for a few peaches we had eaten, that much about simplicity and hospitality. Looking at his red face, it did not show Grecian grace but as if burnt by an iron foundry. I touched his hand. It was 104 fever by my experience. It was 6 days old. Asked him to show his tongue, white like fresh cotton, other symptomps indicated typhoid. In 1984 Agha Khan Foundation conducted a water decease survey in Hunza. It was shocking 80% of Hunza suffer from gastric deaseases and women from faminine deaseses which were beyond descriptions. So much about longitivity. Now Alexander's Left-Over Myth: Hunza was part of undivided Kashmir, so people are genetically fair skinned Kashmiris. Some Tajik blood and of course some Greek blood. But let me put Alexander's Invasion of India in a better historic perspective. Alexander crossed right bank or north bank of Mighty Indus at present Swat where his advanced scouts found a shallow and narrow gorge which was easy to forge by earth and stones for army to cross. Swat is 200 miles south of Hunza and Indus does not pass at Hunza. Only Gilgit and Hunza Rivulates brace town banks. Resham Route ( present Karakoram Highway) was narrow and hairpinned curved, fit for single line of camels and bulls for commerce, not for mighty army. Alexander's remnants ruled present Eastern and north NWFP up to Taxila, and Chitral Afghanistan, Uzbekistan and part of Tjakistan in north for 400 years.Their culture was totally wiped out by expansion of Muslim Empire (Ommayyas and Abbasis) and later Munghol Hordes. The story of "Financial Time" and such questionable publicatoins are cockeyed and has some kind of suspicious motives of politicians behind it.Why did Nazis have to go to Hunza for seraching Aryans? Whole Central Asian Steppes has been and still is Aryan race.. Name Mecedonia started blurring out when the great Invader rapper and pillager named Alexander left it to spread out thin up to 3000mile distant India. Now coming to dual name Mecedonia:What is name? Alexander fist beat the hell out of Greece before proceeding to his big adventure eastward.Why should Greece fret about the name of its Invader? There is mor at the bottom of this new gimmick. What was history of that "Great" Alexander? He was a recorded passive homo boy of Socrates, and great invador on the the already weakened Byzantine Empir's Mid East Colonies, and Persia. If any body could put real resistance was Indian King Porus on righ Bank of Indus in the Punjab near present Multan.. But Porus lost because he used heavy and slow mobile Elephants in front of trim and fast moving Alexander's Archers. Indians were no less accomplished Archers themselves but their style of throwing arrows with their knees bent made them less mobile, compared to Alexander's archers shooting while standing. Nevertheless Porus Battle took the juice out of Alexander's army's gusto and they revolted to go back home. And he was stung by a poisonous fly on Makran Coast (I have built 600Km Coastal road on the track passed by Alexnader on his return and know of those deadly flies).Severeally ill on his way back to Iran, and died at age 33 in Iraq. So if Alexander was "great" pillager, rapper and murderer why not call Genghis Khan "Great?" Because he had brown skin? Now coming to the Hunza Prince calling the Land of his invader as his mother land kissing it and gets red carpet in Macedonia. Macedonia a city size small part of the Balkan (Yugoslavia) was only a geographic and historic description till 1996 when Balkan war split Tito's Land mass. It is similar to people of S. Ossittia and Dagestan and Chechnya (all Mongol desendents) going to Mangolia and kiss its land call it home land. Its like German Population in WWII going to Germany and kiss mother Berlin as mother land. I assure you there is a deeper malice in Prince's visit to Mecedonia. USA is encircling China. They got India in their pocket under nuclear trearty last month. They have "Lillypads" of their army installations in bordering Kyrghizia and Tajikistan and Kazakastan. South Ossittia is one more to encircle Russia. Macedonia's root in Hunza if expoited may inflame those sick idiots, which is sitting at the border of China and India. Otherwise why such fanfare for a non discript Prince from "Mountains" Have you seen Hunza?? Threre is a 5 star Hotel of Agha Khan Foundation because 100% of Hunzan are of Ismaili Faith. The"Prince" would sell Hunza to USA or India for one more diamond ring. We should look at two sides of the coins." this is the most shameful and sinister move on the part of the spineless, mindless,and visionless former prince, historiucally known 'Shahzada lalu Khan ka Dhol' aka Ghaanfar Ali Khan and his band who is trying hard to get patronage of the American imperialists to play a role like Karzai in the most sensitive area just to get a few bucks. 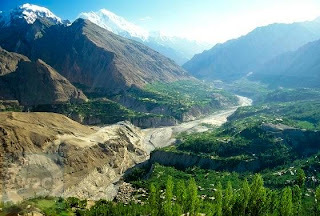 It is also a matter of shame for the people of Hunza to be called the ramnanats or offsprings of the "great pillager, looter and invader-- Alaxadner". there has been no historical evidence or documents that could prove that the peopleof |Hunza are the offspring of the ramnanats of Alaxander;s army. The political leadership and historians should take notice of this imperialist shamful conspiracy and unmask the characters behind it. I fully agree with the observations of Mr Riaz. Pakistan's north is as mysterious as it is beautiful for me and many of my readers. It's nice to hear your authentic voice from the northern areas with roots in the north and direct knowledge and experience of the land and the people there. I have very carefully tried to understand the purpose behind comments of Haq, Razzak and Farman. Their remarks are not free from biases and facts that surrounds the origin of the people of Hunza to be the Army of Alexander the great. Farman Ali from Hunza and ethnically a Gich (Wakhi), without any logical argument or justification mentions that people of Hunza should feel shame for their being the decedents of Alexander the great. I am quite sure that he knows that is not just a matter of a decade or two rather for century people of Hunza are feeling proud to be the descendents of the Armies of Alexander the great. Even the folk tales of Hunza indicate this linage very clearly, and people of Hunza are feeling proud of it because they are fully convinced that the armies of the Alexander the great are their ancestors. Let talk about Haq's comments, as in his concluding remarks he was furious about killings of six Pakistanis in a fake terrorist encounter, it is point to be condemned if it is true. However, the topic of his comment "Pakistan's Greek and Macedonian Connection" is highly dubious. I think he is not a illiterate fool, and he must know that the whole of Northern Area's is not yet part of Pakistan, it is in fact under occupation and deprived of its legitimate and human rights by the madness of Govt. of Pakistan. More than that his comments seems to give an impression that being a Pakistani, unfortunately who are known in the world for nothing other than terrorism, dictatorship, corruption and poverty is not happy with West and so much with Macedonia. His gregarious feeling are because of the very important strategic important of Hunza for Pakistan and now being highly educated and political aware community, people of Hunza may no longer tolerate Pakistani oppression and western support will provide an additional help to the people of Hunza. Remember, people of Hunza also have a great respect for China, the people of Hunza look at China as one of their most reliable supporters and sincere friends but they look at Pakistani administration as a highly untrustworthy, intolerable, illegitimate ruler. They are proud to be Macedonians. Mr.Razzak seems to be lost in details, he cannot make a proper connection of what he wants to say, he denies a worldly known fact of the longevity of Hunza people based of modern medical, anthropological and cultural researches. He based his arguments on his four to five decades old a lay man's memory of his visit to Hunza. He has very poor arguments to say that people of Hunza are of Kashmiri origin, if you say it at the face of anybody from Hunza that he is a Kashmiri, I am quite sure he will loath at your face and will think that you are a mad person. Because it is a first revelation in a very foolishly way, without any proper support. If the color is the only indicator of a similar race than all the Phatans and Afghanis and Turks belong to the same race, of course they are not. To conclude, I have been traveling to Huzna many times since 1960s. I have always heard from the people of Hunza unanimously that they are the descendents of the armies of Alexander the great, and recent research findings based on linguistic similarities, oral and ritual traditions, and cultural similarities that they are belonging to the armies of Alexander the great. The armies who reached to the Swat valley from Greece, nothing could stop them to advance towards further north on the silk route, even when the Alexander the great have turned back. Saying by Razzak that on the silk route on which camels and bulls can travel and human armies could not travel is nothing than very stupid comment. Keeping aside political and ethnic biases, the linkage of the people of Hunza with the Armies of the Alexander the great is a fact based on modern research and historic linkages. 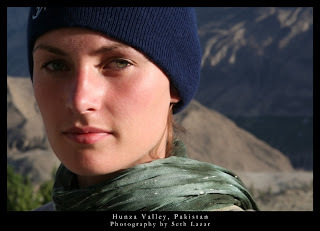 The picture of the "Hunza" girl who appears to be complete European is misleading. She is NOT a Hunza! She is just a model traveling with the photographer to that region. Anon: "The picture of the "Hunza" girl who appears to be complete European is misleading. She is NOT a Hunza! She is just a model traveling with the photographer to that region." I believe the picture is authentic. It is a Hunza girl. I have personal friends from that area whose family members look like that. In fact, one of them is right here in the US, and she is confused by everyone as European, even though both her parents are Pakistanis from northern areas. Well i could say about Mr Riaz Haq's and Farman Ali's comments. Please try to comment on the basis of facts and data. it seems like an emotional outragious denial, i would say the typical Pakistani mind which doubts on everything, has been used to write these comments. it takes centries to form a cuture, Mr Riaz why dont you suddently wear small shorts and ride on a horse like Irish people,,is that possible ? ?you would never do that, so how come Kashmiris and Hunzukutz are similar in any way, look at our music, our dress, our language, our everything, your baseless comment that we are same as Kashmiris has pissed me off. This is our motherland, i trust my grandfather , i trust my folk stories rather then your political motives. It is the people of Hunza who have with help of their own will ,came out of dark ages drawn by Pakistanis, or else it would be more like balochistan or Waziristan. We are proud of our identity , at least we are sure we are not anywhere near to Pathans, Kashmiris or Tajiks. Hunza is the most safest town in whole Pakistan this is our identity that makes us different then all of you. The email you received from this "Razzak L. " is totally inaccurate. The people of Dagestan and S. Ossetia have nothing to do with Mongols. Does this gentleman even know what he's talking about? Has he even looked up Ossetians and Dags? They are indigenous Caucasian peoples except that the Ossetians are no longer speaking a Caucasian language but an Indo-European (Iranic) one. The Hunza have no genetic links to Greeks or even linguistic. Pakistan's various languages have more in common with Greek & Macedonian than does the language isolate of the Hunza (Burushaski). Alexander is to Greece as Prophet Muhammad is to Saudi Arabia. Two modern-day states inheriting an ancient figure. Oh and as for the picture..that IS totally an authentic picture in fact if u still doubt i can show you my picture..blonde haired green eyed white skin..and you judge!! The New York Times published an article in 2014 that had a fascinating description of the Kalash, an ancient ethnic group living high in the remote mountains of Pakistan's Hindu Kush. For centuries this light-skinned, pagan people have claimed to be the long-lost descendants of Alexander the Great's world-conquering armies, which invaded this region in the fourth century B.C. 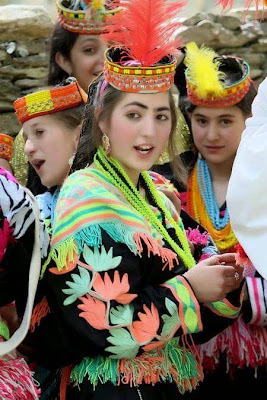 The animist Kalash are outwardly different from the darker-skinned Pakistani Muslims who live in the lowlands below them, so it seemed plausible. However, there had been no proof of this remarkable claim until the geneticists quoted in The New York Times found that the Kalash people's DNA seems to indicate that they had an infusion of European blood during a "mixing event" at roughly the time of Alexander's conquests. This isolated people are thus most likely the direct descendants of the ancient Greek-Macedonian armies who set up outposts in this region 2,300 years ago. Gul Sayed, 25, sports a grin a mile wide as she hugs me, a lone foreigner in her home. She is a member of the Kalasha, a peace-loving pagan tribe living in the remote villages that lie between Northern Pakistan’s Chitral Valley and the Afghan border. She’s dressed in a black robe embroidered with rainbow threads, a beaded headdress adorned with cowrie shells and colorful necklaces. Rumour has it the blue-eyed, fair-skinned Kalasha are the descendants of the armies of Alexander the Great. But unlike their putative bellicose ancestors, the country’s smallest minority group -- numbering around 3,000 -- prefers to make love, not war. Proud of their warm, caring, crime-free culture, these could just be the happiest people in Pakistan. Take the tribe’s approach to matters of the heart. Loveless liaisons hold no appeal for the spirited Kalasha women: "We choose our husbands, and if they don’t treat us well, or it doesn’t work out, we can leave and find a new partner," says Gul, as her two friends, teenage mothers Farida and Asmar, nod and blush. Nothing to shout about if you're a Western woman, but under rural Pakistan's strict Islamic code, it's a radical divergence from the norm. Here in their rustic one-room homes in the valley of Rumbur, the ladies clutch calm, cherubic infants, the progeny of such liberal unions. They live in tune with nature, amidst fields filled with crops, walnut, apricot and mulberry trees, and flanked by fast-flowing streams. From the terrace of Gul’s house, a web of channels and aqueducts fans out to distribute water to everyone in the village. In the distance stands a mill, and further away a darkened temple, its wooden statues and altar stained with the blood of goats that are occasionally sacrificed to honor the Kalasha’s spirit ancestors. As we nibble on grapes and apples laid out on a rug on the floor, Gul explains that she has just returned from the seclusion of the Bashali, a house at the bottom of the village, where the women are quarantined during menstruation or pregnancy. You’d think being viewed as impure, as Kalasha women are during this time, and forbidden to mingle with the menfolk, might dampen their spirits. But no. It seems the Bashali is the perfect excuse for women to chill out. "We sing, gossip and sew -- no chores," says Gul, smiling. Up in higher pastures, a shepherd, who like most Kalasha men wears the Pakistani garb of shalwar khameez, is tending his goats. Managing livestock is the main occupation of the men. "My husband has six cows and three hundred goats," says Asmar. And from the rooftop of Gul's house, I can see what the women do when they’re not in the Bashali, or gathering water, fruit, or firewood from the forests. A couple of meters below, a girl is milling maize to make flatbread to be eaten with vegetable and goat curry, honey and tangy goat’s cheese, or tea, for a Kalasha-style Continental breakfast. On a roof to the left, another violet-eyed beauty is bent over a sewing machine, her eyebrows knit in concentration as she adds a rainbow-colored border to a dress. By her side a wizened old woman sits with a loom between her legs, weaving black cloth for the new clothes they will wear for the three-day Joshi Spring Festival. The Kalasha love a knees-up. Joshi, held in May, is one of four major festivals celebrated by the tribe. "We seek the blessings of our gods and goddesses for the safety of our herds and crops," explains Gul. At the break of dawn on the first day, children gather walnut branches and flowers to decorate their homes, and the doorway of the temple. Year round, the Kalasha dance their way through a stream of festivals and rituals, and socially and culturally, theirs appears to be a joyful existence. The only shadow on their rich, textured lives are the attitudes of some local Muslims towards their beliefs. "They call us 'Kafirs,' unbelievers," says Gul, who like many of the Kalasha are fearful of their Islamic compatriots who live outside the valleys. In years gone by the Kalasha were threatened with forcible conversion to Islam, now the tribe receives government protection, improved health and education services, and -- bar an isolated incident when a Greek volunteer was kidnapped by the Taliban in 2009 and later released -- are largely untouched by the region’s political troubles. Left to get on with living life to the brim, the Kalasha do just that, with compelling devotion. Travelpak, www.travelpak.co.uk, based in London, can organize tailor-made tours to Pakistan, departing from anywhere in the world. A two-week trip, taking in the Kalasha Valleys of Khyber Pakhtunkhwa and Northern Areas, costs from around US$1,600, excluding the cost of international flights. Pakistan International Airlines (www.pia.com), Emirates (www.Emirates.com), Gulf Air (www.gulfair.com) all fly to Islamabad from destinations within Asia. Dear hunzukuch, Why are only you trying to be the Burusho? Hunza has a population of Brusho less than 50000. While at the other hands Nagar State has more than 80000 Brusho inhabitants. These people are trying be the decedents of so-called Great alex. While Brusho people has been here in Gilgit Baltistan for almost 4 thousnd years.The pics of girls is true but they do not belong to hunza they belong to Kailash Chatral. Kailash people has a different history. They are not Burusho.Hunza has only 10% inhabitants of total Burusho in Gilgit Baltistan. Intellectuals of Hunza are the most hypocrite while telling others their so-called great history. It is true, Hunza peoples are descendants of alexander the great army ,and we feel proud .we see blood and we not see your ideologies and we have proof of DNA test with people of macedonia .we are not greece and we have our own identity yes we are descendants of alexander the grate army. Illyrians dachians thracians and hellenes. As well as some conquered calling the way..so they can be descendants of any of those 4 tribes that had very similar traditions and some others.